For the past few years, I’ve been one of the bakers of my church’s eucharistic bread, the round, unleavened bread that’s blessed as part of the Mass and shared with the community. About every five or six weeks, it’s my turn to bring 5 “loaves” to the Saturday afternoon Mass. I’m always afraid that, in the midst of the comings and goings of the weekend, I’ll forget to bake, so I add a reminder to the fridge door. I really love to bake yeast bread but rarely do so. I love proofing the yeast, kneading the dough, watching it rise, shaping the loaves. And the smell? Heavenly! Unleavened bread? Not so much. It’s not meant to be kneaded more than a couple minutes before being patted into a circle and rolled thin. The balance of sticky and floury is a delicate one. On more than one occasion, I’ve had to start over after scraping a stuck loaf off the counter. After rolling, each loaf is imprinted with a special press (the name of which escapes me). This is another opportunity for stickiness! Yesterday, I had some extra dough which is patted into lumpy free-form circles. Perfect with my supper of turkey soup! In knitting news, progress on Sock #2 is brought to you in part by the Winter Olympics and the NBA Slam Dunk and Three-Pointer competitions. I’ve cast on my first project of 2017 — good old reliable socks. These are in a blue and silver gray colorway, Beyond the Wall, of Felici Sock Yarn. To be completely candid (and why not be completely candid? 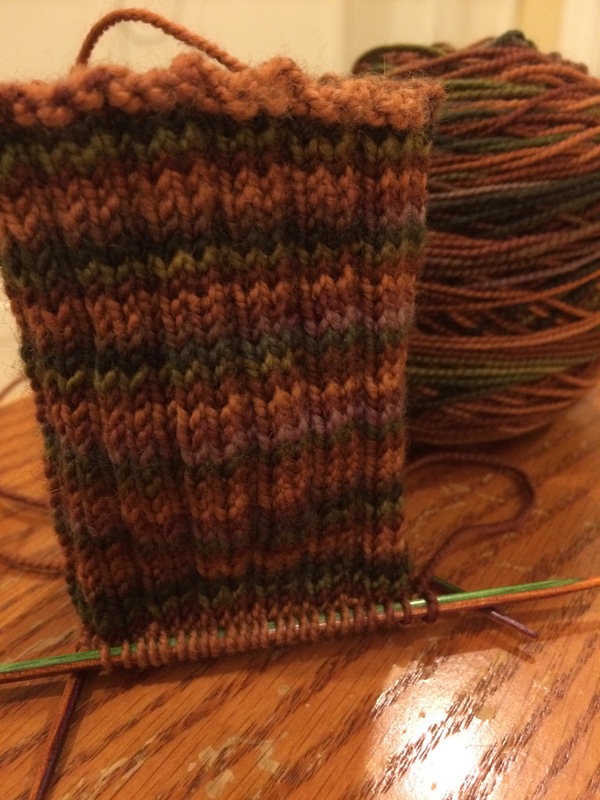 ), I cast on the first sock in late December but discovered after a few inches that I’d selected a too-large needle. So I ripped it all out, switched to size 1 (2.25mm), and began again. This time I’m using double-pointed needles, which I’ve learned that I prefer to the Magic Loop method. I find the DPNs faster to work with — no fiddly shifting of stitches and moving of the cable. Do you have a preference for circular knitting? DPNs? two circulars? Magic Loop? With the completion of the green-gray Chromatic Cowl, I found myself in the unusual situation of not having a Work in Progress (WIP). As I pulled out some patterns, knitting books, and bits of my yarn stash, I mentioned my dilemma — or opportunity — to Michael. He thought for a moment and, without really trying, came up with a solution. The Yarn Harlot’s Good, Plain Sock Recipe in 3p, 1k ribbing. Cherry Tree Hill Yarn’s self-striping “Fingerpaints” in Java Jive colorway. I gave more knitted gifts for Christmas last year than I had before. Usually I start around Thanksgiving, and it doesn’t take a genius to realize that that’s not enough time to make more than a couple of items. I’m not a chunky knit, make-it-in-a-day knitter although I definitely understand the appeal. Knitting whenever and wherever possible was my goal. Socks are great anytime projects because they’re small enough to stick in a bag or pocket and pull out anytime you have more than a minute to wait — just about anywhere. Like at the pediatrician’s office. I just love this self-striping yarn, Opal Hundertwasser, which knits up beautifully — almost like magic. OK, I got a few odd looks while knitting at a college hockey game, but I did my best to be a Fearless Knitter (as I tell my knitting students). A Fearless Knitter on a mission. Handknit socks aren’t everyone’s first choice, but I’m doing my best to convert those folks one pair at a time.